How do journalists use technology around the world? 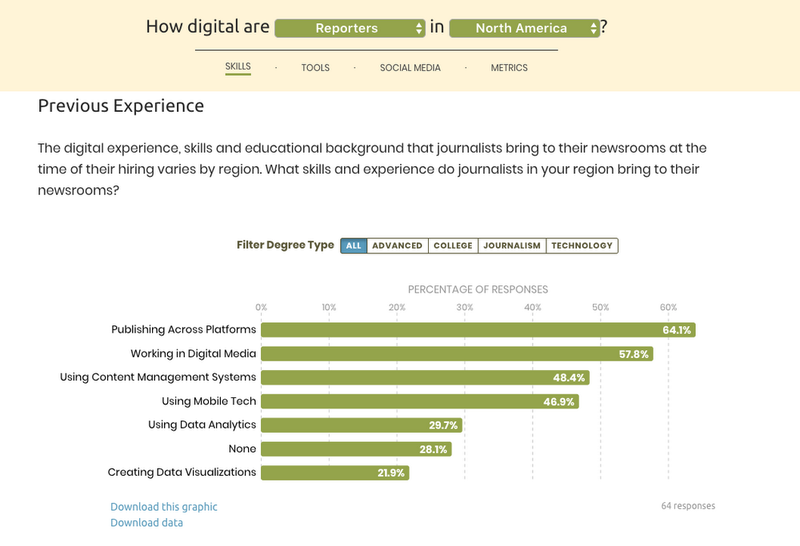 A new interactive explorer produced by the International Center for Journalists (ICFJ) and Google News Lab makes it easy to dig into a wealth of new survey data from hundreds of newsrooms worldwide. Aimed at gauging how well journalists are keeping pace with the tech revolution, the survey report garnered responses from more than 1,800 newsroom managers and journalists across 130 countries. The data explorer allows you sift through this unprecedented dataset and surface new findings that shed light on trends in your region and around the world. You can filter by variables such as job position and newsroom type, as well as download the aggregated, anonymized survey data for further analysis. Which tools are reporters in Sub-Saharan Africa using to reach and interact with their audiences? What types of training are most valued by news editors in Latin America and the Caribbean? How are newsroom employees in Eurasia/the former USSR securing their data - and how does that compare to those in North America? 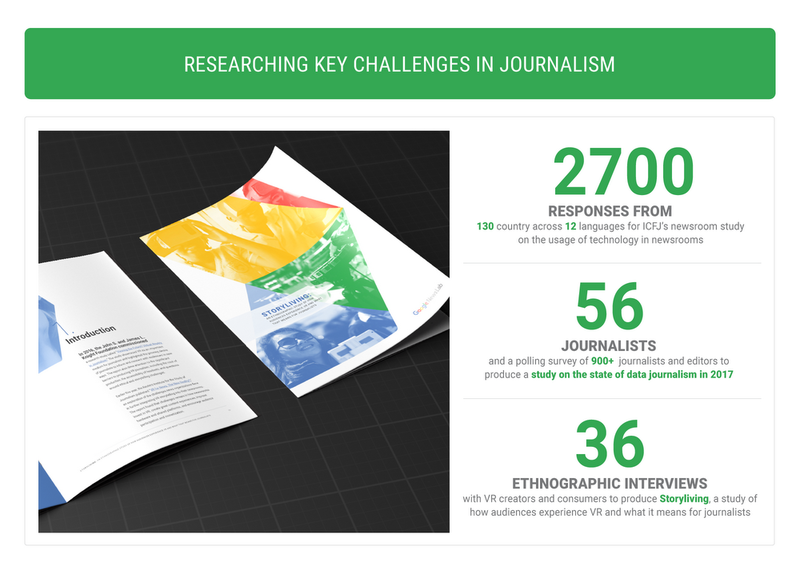 ICFJ partnered with Google News Lab, design studio Polygraph and University of Miami’s Knight Chair Alberto Cairo to build the data visualization tool using findings from its State of Technology in Global Newsrooms study, the first-ever global survey of the adoption of technology by the news media. Check out the data explorer, and see highlights from the survey on Medium. This entry was posted in Google News Blog and tagged Google News, Journalism & News on March 6, 2018 by Simon Rogers. Data visualization brings more eyes, attention and understanding to complex stories. When it works well, it can make a story crystal-clear. But it takes effort, coding and time—and is sometimes out of reach for all but the biggest newsrooms. One easy way to make data visualizations is through Flourish, a tool that helps you design and create graphics to embed on a website or export as a SVG file. We’re making Flourish free for journalists, so that it’ll be easier for newsrooms of all sizes and budgets to create their own data visualizations. We’re also working with design studio Pitch Interactive to make free virtual reality templates for newsrooms in Flourish. Here’s an example: The visual above shows related Google searches for TV shows. Any journalist in a newsroom could use that template, but with different data. For example, the visual below shows searches for U.S. Senators before this year’s midterm elections. (And here’s the visual code on GitHub). Traditionally, creating the same visual with different data is a tricky job involving developers. Flourish makes that easy—visuals can just be reused as they are, or you can create “stories” to narrate the visual by adding captions and leading the user on a visual journey. th Flourish, journalists with no coding experience can make high-end interactive graphics and stories with no tech support—check out these tutorial videos for extra help. Crucially for the data journalism community, Flourish lets newsrooms share templates with each other. Though newsrooms can create some private templates, they can open-source others. Flourish was soft-launched last year, and since then, the development team worked with designers and data journalists to build the launch version that has just been released. In that time, hundreds of journalists and newsrooms have signed up to use Flourish. Examples of how newsrooms have used data visualizations in their reporting. 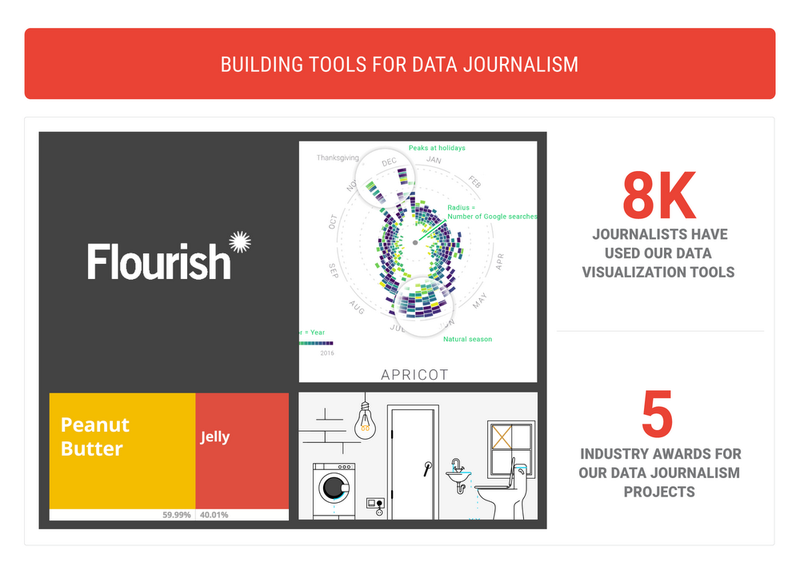 Flourish is just one of a series of tools and resources in our News Lab data journalism toolkit. Other tools include Tilegrams, Data Gif Maker and the Data Journalism Handbook. Look for more this year as we work to make it easier for data journalists to investigate, process, visualize and surface their data across the news industry. This entry was posted in Google News Blog and tagged Google News, Journalism & News on February 7, 2018 by Simon Rogers. During crises like Hurricane Irma or the Santa Rosa fires, local reporters are often the first on the scene and capture critical coverage. They have in-depth knowledge of the community and its landmarks, providing insights and context to these breaking news events. When news is breaking, every minute of your newsroom’s time matters. So we want to make sure you’re set up and ready to go across Google products in the case of a crisis hitting your local community. We’ve created a checklist to help ensure your stories reach the biggest possible audience from Google’s platforms like Search, Google News and Google Play Newsstand—and that you’re aware of the array of tools that can help you report on breaking news. These suggestions include best practices to implement in advance of a breaking news event, as well as steps to take the moment an event happens—helping your reporters tell the important stories, while making it easy for local and national audiences to find them. Create an edition in Google Play Newsstand: Google Play Newsstand is a news and magazine reading app with more than 100 million monthly active users. Readers get a customized stream of news that gets better as they use it, and can subscribe to specific publishers and topics of interest. Set up and publish your local editions on Google Play Newsstand to distribute your content to additional readers. Check your presence in Google News: Google drives more than 10 billion clicks a month to news sites, and Google News is a key piece of this process. Google News data feeds into many of our other tools, such as Google Search and Google Finance. Check that your local sites are included in Google News, and if not, start the application process. Once you’ve done so, learn more about additional Google News features like Editors’ Picks. With Editors’ Picks, your editors can choose what stories they’d like to highlight, and these stories could potentially appear right on the Google News homepage. Leverage the speed of AMP: More than 50% of people abandon a page that takes more than three seconds to load, and mobile pagespeed is even more critical for users during times of crisis. With AMP, your mobile articles are consistently fast, easy-to-read and high-performing across devices and distribution platforms. AMP pages load four times faster—in less than one second when referred from Google Search. Learn the basics of AMP and how to implement AMP on your site. Create a presence on YouTube: Each day more than 5 million hours of news content is consumed on YouTube. Establish your presence by creating YouTube channels for your sites. It’s important to upload your top video content right away, and to always include location and descriptive information so your videos can be found easily. Maximize your potential audience: If you have a paywall, consider removing it during the breaking news event so those in the community can access the stories and information you’re writing. It's in these crucial times of need that local media can really show their value to the community they report on, giving publishers the opportunity to turn that casual reader into a loyal subscriber after the event. Build a monetization strategy with an influx of traffic in mind: As you see your traffic increase during the breaking news event, you need a strategy in place to monetize the additional impressions. For example, if you use Doubleclick AdExchange, consider lowering your CPM thresholds to sell more impressions and drive revenue. Add Fact Check markup to your debunking articles: During breaking news, there’s a thirst for cold hard facts, yet as events unfold, these facts can take time to emerge. If your team debunks any misinformation being circulated about a breaking news event, we recommend adding the Fact Check markup. Implementing the Fact Check markup will label and highlight your article on Google properties as "fact check," meaning that particular article is fact checking another article or statement. Implement the Google News standout tag: Adding the standout tag to your articles gives our algorithm a signal that you’ve published a critical local story, and increases the likelihood the article will appear with the “Featured” label in Google News. We recommend using the standout tag to flag your top local content (up to seven articles per week) for breaking news events. Building on your YouTube audience: Upload content quickly on your YouTube channel, provide strong metadata, and create new videos to provide updates on the story. We also recommend that you create a playlist for the event, so people can more easily discover and browse your event-specific videos. Use Google Trends Local to understand what your community is looking for: Search trends data can be really useful to give you a view into what your local community is concerned about or focused on—whether readers are looking for sandbag stations or evacuation sites. Check out the Google Trends site for recent search trends data. Incorporate Google Maps and Earth imagery into your stories to help readers: Create your own emergency maps (like this Google My Map from CAL FIRE), and sign up to receive fresh satellite imagery to show before and after views of an affected area. As your team uses these tips, we’d love to hear firsthand feedback and examples, which you can send to newslabsupport@google.com. This entry was posted in Google News Blog and tagged Google News, Journalism & News on December 20, 2017 by Megan Favat. In the news and technology communities, the collective sense of urgency about the future of journalism reached new heights this year. Never before has the press been so important—or so under threat. Technology and platforms like the ones Google has built present extraordinary opportunities to strengthen journalism, but they require newsrooms and tech companies working closely together to get it right. That’s why the Google News Lab exists. In a Keyword series this week, we’ve shared the work the News Lab is doing around the world to address industry challenges and take advantage of new technologies. Today, in our final post in this series, we’re stepping back to give a holistic view of 10 major developments in our work this last year. We’re looking forward to an even bigger 2018 and would love your feedback on how we can partner with the industry to build a stronger future for news. The spread of misinformation is a growing problem for open societies everywhere. So, helping news organizations confront that challenge—especially during elections—was a key focus for us. We helped the First Draft Coalition pioneer new collaborative reporting models to combat misinformation and verify news stories during the UK, French, and German elections. We worked closely with the news industry to better highlight accurate, quality content on our platforms with new product features and partnerships. Along with the Trust Project, we produced eight indicators of trust that newsrooms can add to their content to help users distinguish between quality content and misinformation. We also partnered with the International Fact-Checking Network and The Poynter Institute to increase the number of verified fact checkers across the world. Bringing underrepresented voices into newsrooms can help uncover important stories that are left out of mainstream news coverage. We supported ASNE’s survey to get a better sense of diversity in newsrooms across the U.S. We also partnered with organizations in the U.S., Brazil, France and Germany to provide journalists from diverse backgrounds with in-depth programs to develop their careers. With revenue pressures challenging the creation of quality local news content, we began investing in projects to strengthen local newsrooms across the U.S. We partnered with the Society for Professional Journalists to train more than 9,000 local reporters in digital skills. We’re also supporting Report for America, an initiative that will use a Teach for America model to place a thousand journalists in local newsrooms over the next five years. To better understand key challenges facing the news industry, we produced studies on the state of data journalism in 2017 and how audiences experience VR and what it means for journalists. We also supported the ICFJ’s newsroom study on the usage of technology in newsrooms. 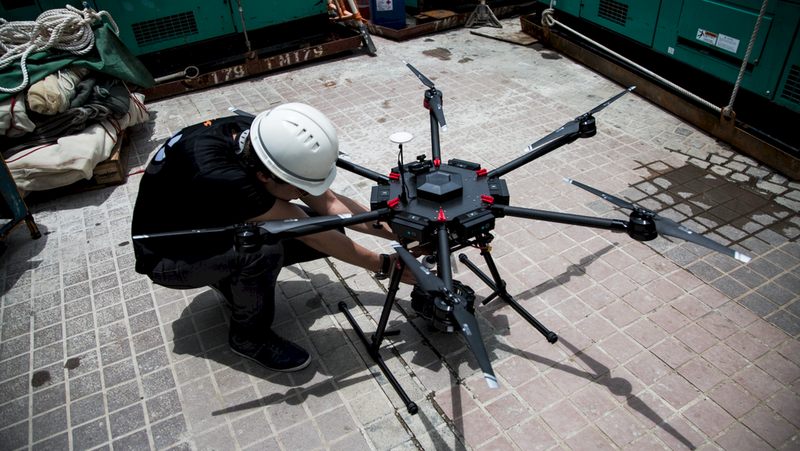 From drones to virtual reality, we helped news organizations understand and use emerging technologies to shape their reporting and engage audiences in new ways. And we experimented with machine learning, too—we partnered with ProPublica to launch Documenting Hate, a project which uses AI to help build a national database for hate crime and bias incidents. Our research into the state of data journalism found that while half of newsrooms have a dedicated data journalist, many lack the tools and resources to be successful. So we built a number of tools—Flourish, Tilegrams, Data Gif Maker, Election Databot— to make data journalism more accessible to newsrooms and journalists across the world. 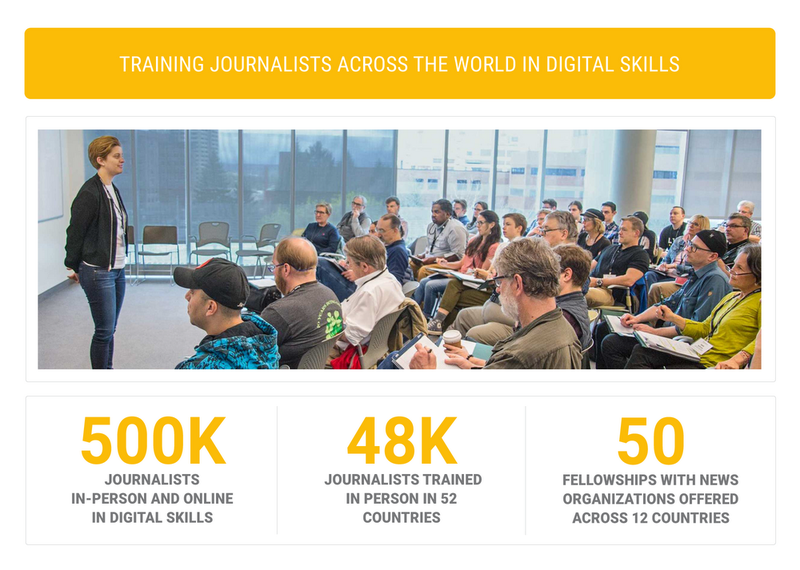 With our online training center, advanced online learning partnerships, and in-person trainings, we helped train more than 500,000 journalists across the world in digital tools and skills for storytelling and reporting. To develop the next generation of digital journalists, we offered more than 50 News Lab Fellowships with major news organizations across 12 countries. Google Trends data offers news organizations a look at the candidates and issues that voters are interested in during election season. 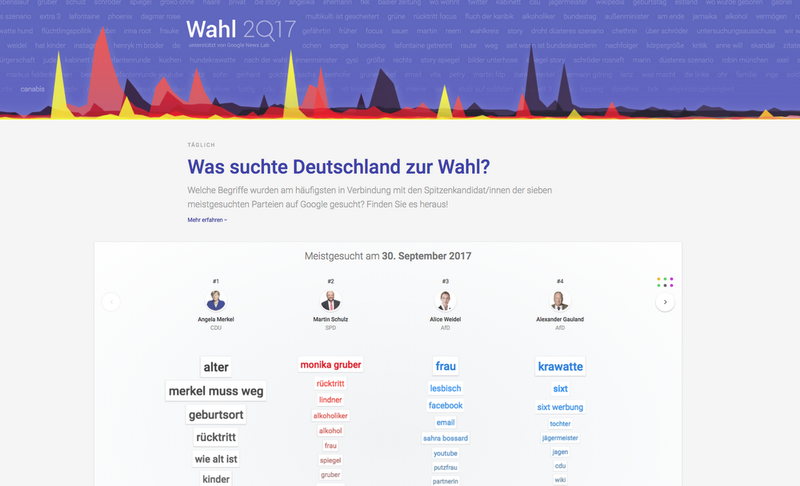 In Germany, we created a Google Trends Hub to show users’ search interest in key candidates and built a visualization tool to bring the data to life. In France, we launched a data driven web app that showed search interest in the candidates over time. This year we launched the News Lab in two new markets: Brazil and in Asia. To kick things off we held inaugural News Lab Summits in both regions—convening journalists from 15 states in Brazil and journalists from 15 countries in Singapore. Since then, we’ve trained more than 8,000 journalists in Brazil and 12,000 journalists in Asia. It’s an exciting time for journalism. There are many challenges, but we are eager to work with the news industry to build a more informed world. Tell us where you think we should put our efforts—we’d love to hear feedback and new ideas. This entry was posted in Google News Blog and tagged Google News, Journalism & News on December 15, 2017 by Steve Grove. This week we’re looking at how the Google News Lab is working with news organizations to build the future of journalism. So far, we shared how the News Lab works with newsrooms to address industry challenges and use emerging technologies. Today, we’ll take a look at the News Lab’s global footprint and its efforts to fuel innovation in newsrooms across the world. Technology continues to change how journalists across the world report and tell stories. But how technology shapes journalism varies from region to region. 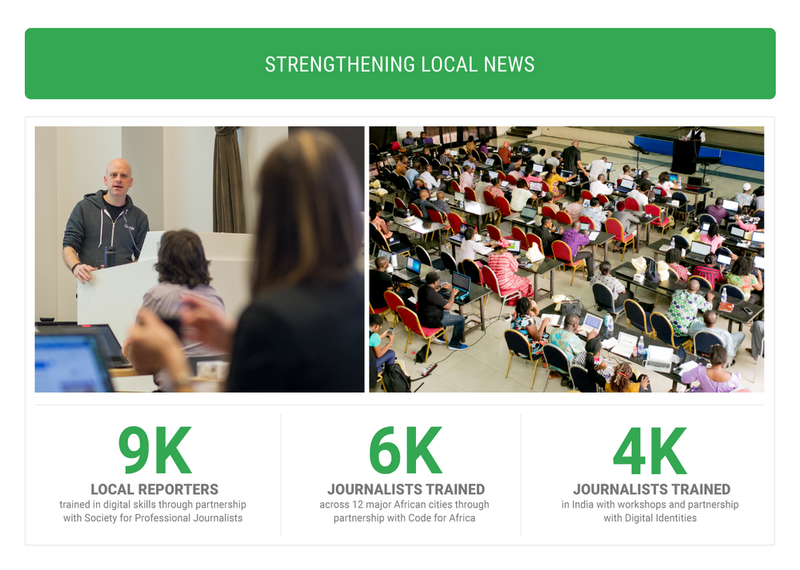 This past year our team, the Google News Lab, conducted in-person trainings for journalists across 52 countries. Today, we take a look at the unique challenges of newsrooms in the regions we serve and how we’ve adapted our mission for each region to help build the future of journalism. In Europe, it’s been another big year for politics with major general elections taking place in the Netherlands, France, UK, Germany and Norway. We wanted to ensure we were helping newsrooms cover these critical moments with the accuracy and depth they required. So, our efforts across these countries focused on helping newsrooms verify digital content in a timely fashion and providing training in digital skills for journalists. We helped the First Draft Coalition pioneer new collaborative reporting models to combat misinformation and verify news stories during the UK, French, and German elections. 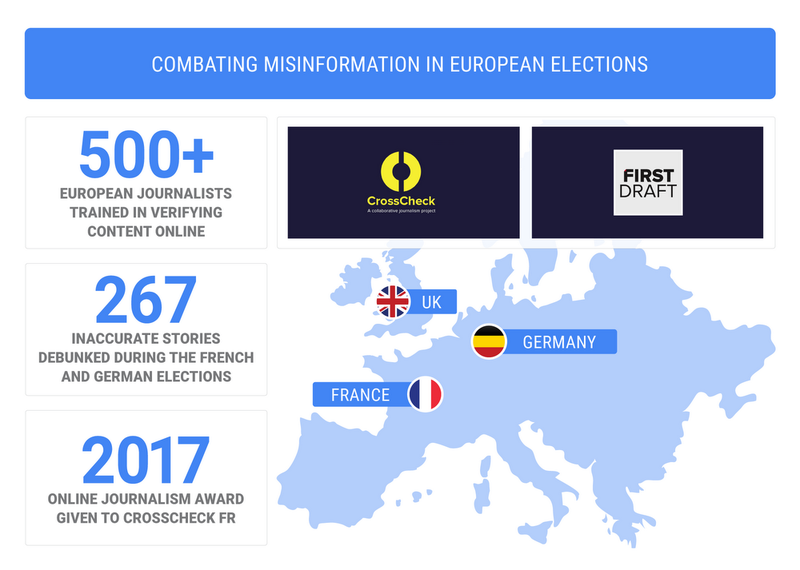 In France, we supported First Draft's launch of CrossCheck; a collaboration among 37 newsrooms to verify or debunk online stories during the election. In the build up to the elections in the UK and Germany, we also supported fact-checking organizations Full Fact and Correctiv to help newsrooms identify new sources of information. These initiatives helped more than 500 European journalists verify content online and debunk 267 inaccurate stories shared on social during the French and German elections. Journalists across Europe used Google Trends to help visualize big political stories—here’s a peek at what they did. 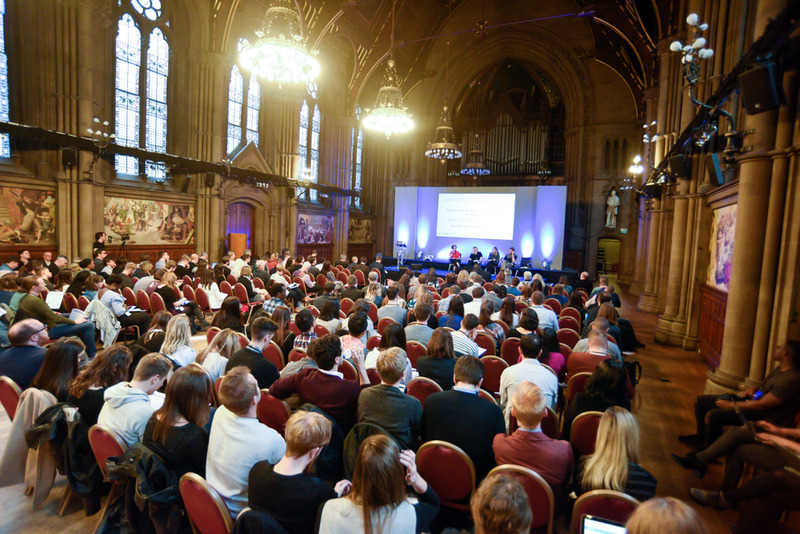 Journalists attending the European Journalism Centre News Impact Summit in Manchester, UK. We continued to ramp up our efforts to train European journalists digital skills. We worked with The European Journalism Centre on the latest series of the News Impact Summit, providing large-scale training events on news gathering and storytelling, combined with design-thinking workshops for journalists in Rome, Hamburg, Budapest, Manchester and Brussels. 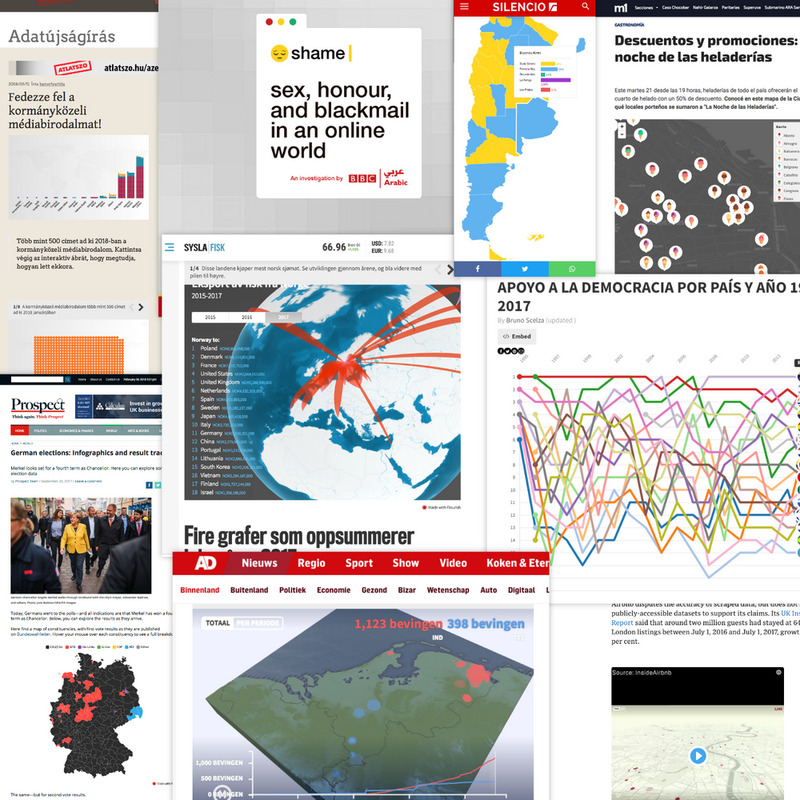 And our partnership with Netzwerk Medien-Trainer has provided over a thousand journalists across northern Europe with expert training on data journalism, verification and mapping. Journalists from across Asia attend a session at our first News Lab Summit in APAC. This year, we expanded our training and programs to the Asia Pacific, where we’ve tailored our approach to meet the specific needs of journalists across this diverse landscape. In a part of the world that is largely mobile-first (or mobile-only) and chat apps are the norm, there are a unique set of opportunities and challenges for newsrooms. 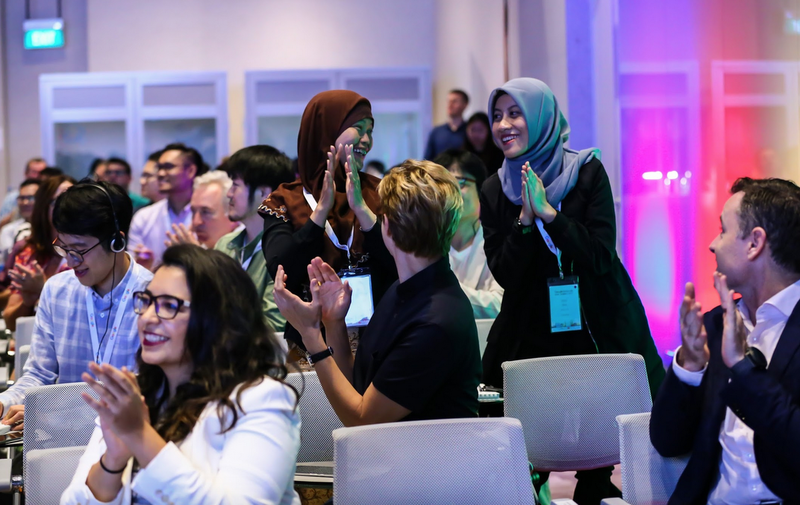 In July, our first News Lab APAC Summit welcomed 180 guests from 150 news organizations across 15 countries to our offices in Singapore. Product specialists and experts from newsrooms across the region came together to share best practices, learn about emerging technologies, and engage in open dialogue on challenges critical to the news industry. In India, our Teaching Fellow has provided training and support to around 4K journalists and journalism students across the country. Our partnership with the Digital Identities team helped journalists in New Delhi experiment and engage new audiences with their stories. Working in partnership with News Lab, the South China Morning Post released an immersive virtual reality project to depict the changing landscape of Hong Kong over 170 years of history. We’re working to support research projects that tackle industry challenges - working with Media Diversity Australia to quantify issues of diversity and representation in the Australian news organizations, while in South Korea we’re supporting a study about the use of chat apps and their role in the news ecosystem. Journalists from across Brazil gathered for an open conversation on the future of news at our first News Lab Summit in Brazil. Working with journalists across Latin America, we elevated new voices beyond traditional newsrooms, and helped established journalists experiment with new technology and research. In Brazil alone there are an estimated 139 million Internet users, providing a huge opportunity for news organizations to experiment and test new formats. 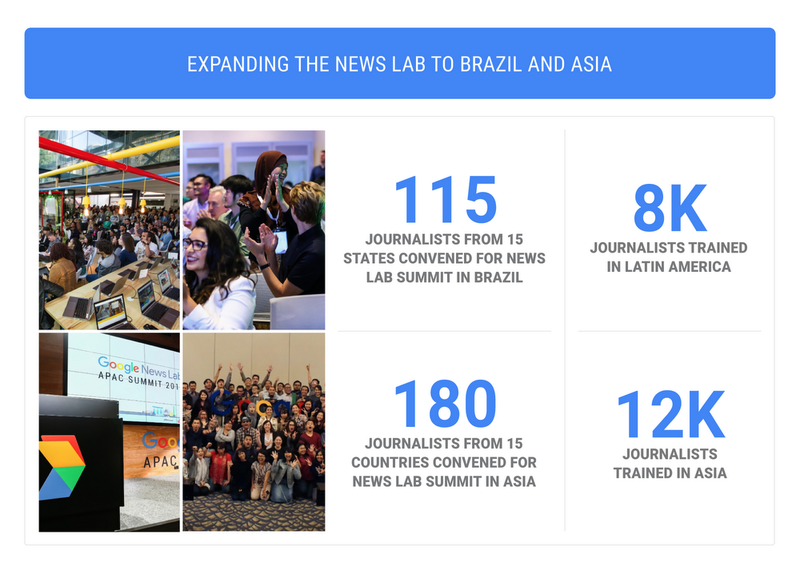 We hosted the first Google News Lab Summit in LatAm Google’s HQ in São Paulo, which convened 115 journalists from across Brazil. Attendees from 71 organizations heard from product managers and industry experts about data journalism, immersive storytelling and verification. Impacto.jo, an experimental project in Brazil supported by the News Lab, helps journalists track the social impact of their reporting. As a part of the project, six organizations including Nexo Jornal, Folha de S. Paulo, Veja, Gazeta do Povo, Nova Escola and Projor will each track the public response and social reaction to their stories. 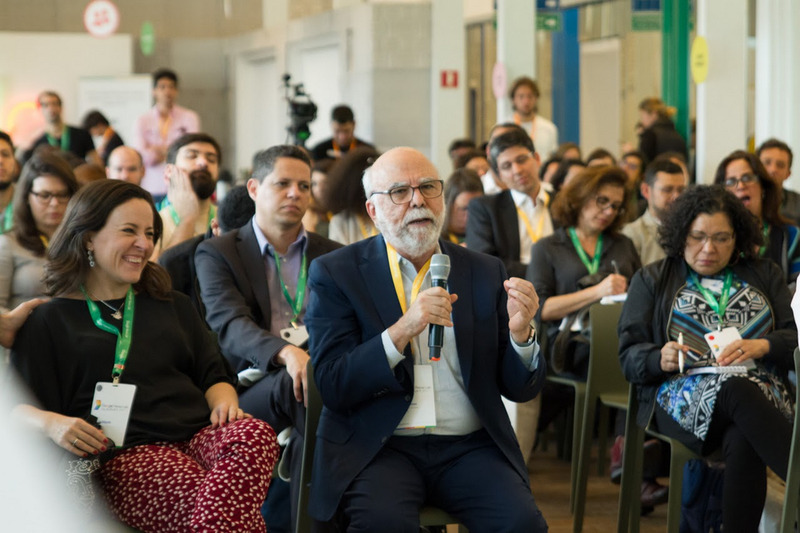 In Brazil, we brought 300 journalists to a first-of-its-kind independent journalism festival in Rio de Janeiro to share ideas on how to engage audiences online with original journalism. We are focused on the growing number of mobile phone users, providing trainings for journalists on digital integration, as it remains a challenge in this part of the world. 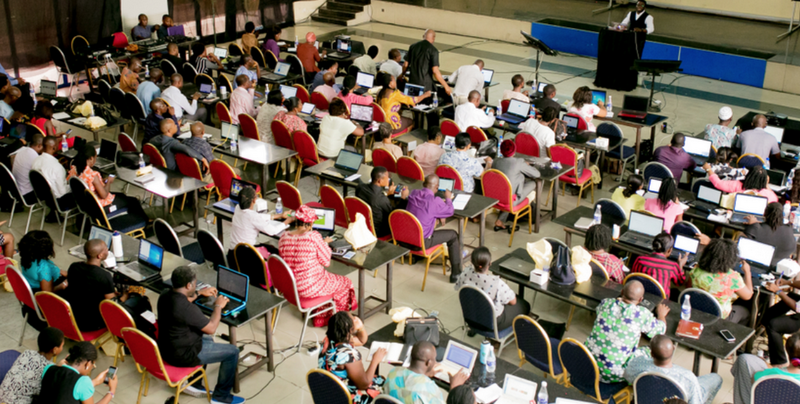 We’re working with Code for Africa and the World Bank to provide training to six thousand journalists across 12 major African cities. Their online learning course will provide self-paced lessons for journalists across Africa. They’re also working to support local Hacks/Hackers meetings to bring journalists and developers together to share new ideas. In South Africa, we held a GEN Editors Lab hackathon, in association with Code for Africa, that brought together 35 developers and journalists to tackle a range of topics including misinformation. This builds on our support for previous events in Nigeria. We’ll be taking the hackathons to Australia, Japan, Indonesia, Italy, Ireland, Portugal and Taiwan. Journalists in Africa going through digital skills training. A bulk of our in-person training work has been made possible by the Google News Lab Teaching Fellowship, which launched this year and enlists industry professionals, academic experts and experienced journalists to help us provide practical, in-person workshops and presentations across the world. In total, we hosted workshops, hackathons, and in-person trainings for 48K journalists across 52 countries. Since we can’t be everywhere in-person, our online training center offers a round-the-clock service in 13 languages including Arabic, Polish, Hebrew and Hindi. We’re continuing to collaborate with training organizations around the world, and our growing Training Network now includes expert trainers in Europe, the U.S. and parts of Asia Pacific. There’s plenty more to do in 2018 and we’re looking forward to working with journalists and newsrooms across the world. This entry was posted in Google News Blog and tagged Google in Asia, Google in Europe, Google News, Journalism & News on December 14, 2017 by Matt Cooke. This week we’re looking at the ways the Google News Lab is working with news organizations to build the future of journalism. Yesterday, we learned about how the News Lab works with newsrooms to address industry challenges. Today, we’ll take a look at how it helps the news industry take advantage of new technologies. From Edward R. Murrow’s legendary radio broadcasts during World War II to smartphones chronicling every beat of the Arab Spring, technology has had a profound impact on how stories are discovered, told, and reach new audiences. With the pace of innovation quickening, it’s essential that news organizations understand and take advantage of today’s emerging technologies. So one of the roles of the Google News Lab is to help newsrooms and journalists learn how to put new technologies to use to shape their reporting. This past year, our programs, trainings and research gave journalists around the world the opportunity to experiment with three important technologies: data journalism, immersive tools like VR, AR and drones, and artificial intelligence (AI) and machine learning (ML). The availability of data has had a profound impact on journalism, fueling powerful reporting, making complicated stories easier to understand, and providing readers with actionable real-time data. To inform our work in this space, this year we commissioned a study on the state of data journalism. The research found that data journalism is increasingly mainstream, with 51 percent of news organizations across the U.S. and Europe now having a dedicated data journalist. 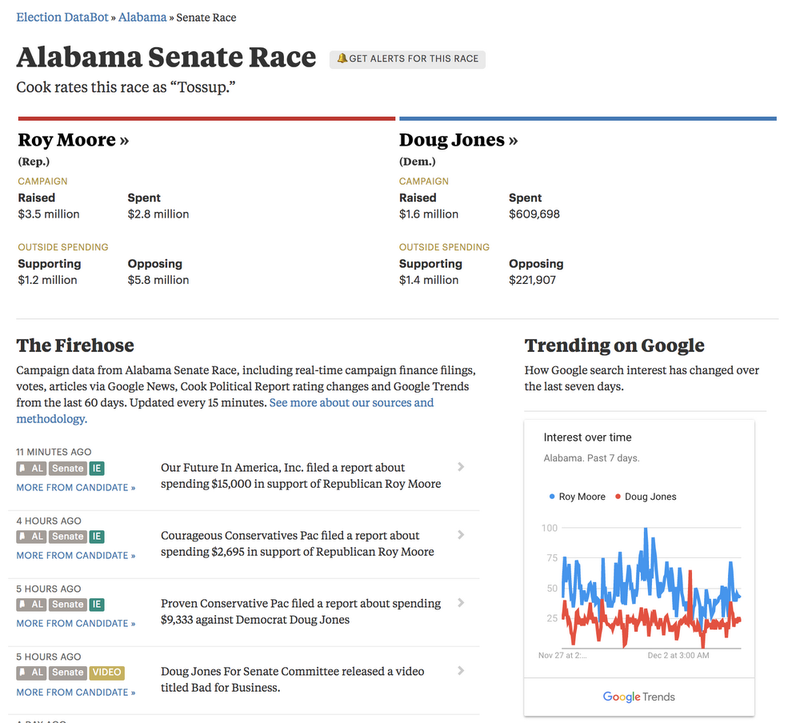 Our efforts to help this growing class of journalists focuses on two areas: curating Google data to fuel newsrooms’ work and building tools to make data journalism accessible. On the curation side, we work with some of the world’s top data visualists to inspire the industry with data visualizations like Inaugurate and a Year in Language. We're particularly focused on ensuring news organizations can benefit from Google Trends data in important moments like elections. 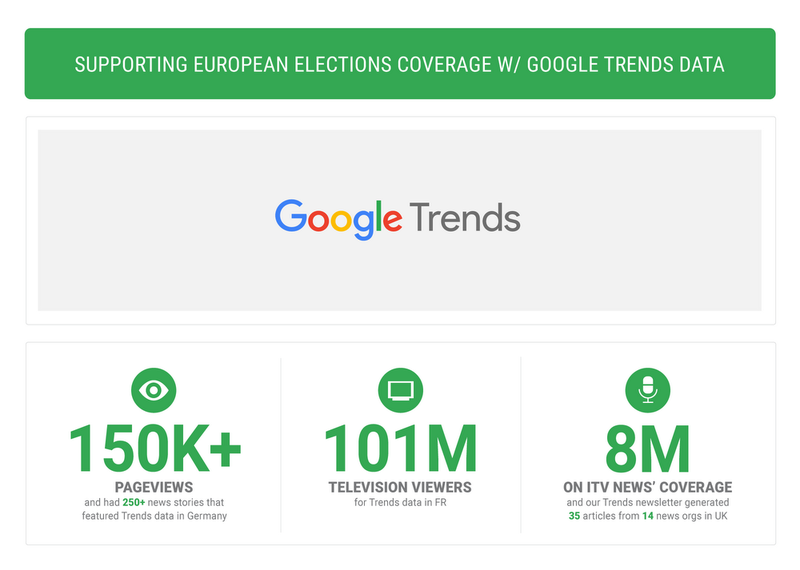 For example, we launched a Google Trends election hub for the German elections, highlighting Search interest in top political issues and parties, and worked with renowned data designer Moritz Stefaner to build a unique visualization to showcase the potential of the data to inform election coverage across European newsrooms. We worked with renowned designer Moritz Stefaner to build a visualization that showcased the topics and political candidates most searched in Germany during the German elections. We’re also building tools that can help make data journalism accessible to more newsrooms. We expanded Tilegrams, a tool to create hexagon maps and other cartograms more easily, to support Germany and France in the runup to the elections in both countries. And we partnered with the data visualization design team Kiln to make Flourish, a tool that offers complex visualization templates, freely available to newsrooms and journalists. As new mediums of storytelling emerge, new techniques and ideas need to be developed and refined to untap the potential of these technologies for journalists. This year, we focused on two technologies that are making storytelling in journalism more compelling: virtual reality and drones. We kicked off the year by commissioning a research study to provide news organizations a better sense of how to use VR in journalism. The study found, for instance, that VR is better suited to convey an emotional impression rather than information. We looked to build on those insights by helping news organizations like Euronews and the South China Morning Post experiment with VR to create stories. And we documented best practices and learnings to share with the broader community. We also looked to strengthen the ecosystem for VR journalism by growing Journalism 360, a group of news industry experts, practitioners and journalists dedicated to empowering experimentation in VR journalism. In 2017, J360 hosted in-person trainings on using VR in journalism from London to Austin, Hong Kong to Berlin. Alongside the Knight Foundation and the Online News Association, we provided $250,000 in grants for projects to advance the field of immersive storytelling. The recent relaxation of regulations by the Federal Aviation Administration around drones made drones more accessible to newsrooms across the U.S., leading to growing interest in drone journalism. Alongside the Poynter Institute and the National Press Photographers Association, we hosted four drone journalism camps across America where more than 300 journalists and photographers learned about legal, ethical and aeronautical issues of drone journalism. The camps helped inspire the use of drones in local and national news stories. Following the camps, we also hosted a leadership summit, where newsroom leaders convened to discuss key challenges on how to work together to grow this emerging field of journalism. We want to help newsroom better understand and use artificial intelligence (AI), a technological development that hold tremendous promise—but also many unanswered questions. To try to get to some of the answers, we convened CTOs from the New York Times and the Associated Press to our New York office to talk about the future of AI in journalism and the challenges and opportunities it presents for newsrooms. We also launched an experimental project with ProPublica, Documenting Hate, which uses AI to generate a national database for hate crime and bias incidents. Hate crimes in America have historically been difficult to track since there is very little official data collected at the national level. By using AI, news organizations are able to close some of the gaps in the data and begin building a national database. Documenting Hate, our partnership with ProPublica, used AI to help create a national database to track hate crime and bias incidents. Finally, to ensure fairness and inclusivity in the way AI is developed and applied, we partnered with MediaShift on a Diversifying AI hackathon. The event, which convened 45 women from across the U.S., focused on coming up with solutions that help bridge gaps between AI and media. 2018 will no doubt bring more opportunity for journalists to innovate using technology. We’d love to hear from journalists about what technologies we can make more accessible and what kinds of programs or hackathons you’d like to see—let us know. This entry was posted in Google News Blog and tagged Google News, Journalism & News on December 13, 2017 by Erica Anderson. 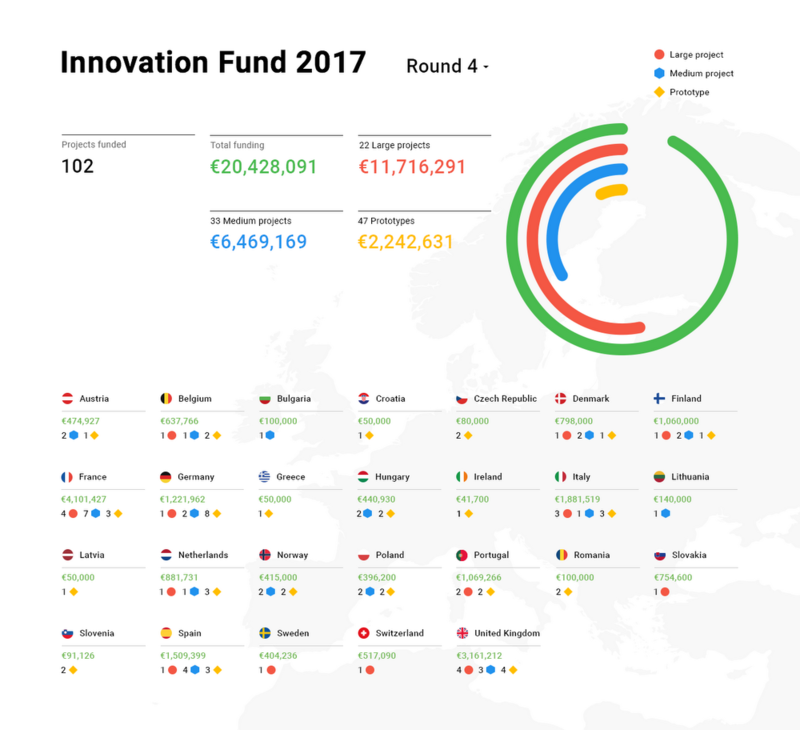 In October 2015, as part of our Digital News Initiative (DNI)—a partnership between Google and news publishers in Europe to support high-quality journalism through technology and innovation—we launched the €150 million DNI Innovation Fund. Today, we’re announcing the recipients of the fourth round of funding, with 102 projects in 26 European countries being offered €20,428,091 to support news innovation projects. This brings the total funding offered so far to €94 million. In this fourth round, we received 685 project submissions from 29 countries. Of the 102 projects funded today, 47 are prototypes (early stage projects requiring up to €50,000 of funding), 33 are medium-sized projects (requiring up to €300,000 of funding) and 22 are large projects (requiring up to €1 million of funding). With €49,804 of funding from the DNI Fund, Stop Propaghate is developing an API supported by machine learning techniques that could help news media organizations 1) automatically identify if a portion of news reporting contains hate speech, and 2) predict the likelihood of a news piece to generate comments containing hate speech. The project is being developed by the Institute for Systems and Computer Engineering, Technology and Science (INESC TEC), a research & development institute located at University of Porto in Portugal. Spot is an Artificial Intelligence-powered marketplace for curating, translating and syndicating valuable articles among independent media organizations, and is being developed by VoxEurop, a European news and debate website. With €281,291 of funding from the DNI Innovation Fund, Spot will allow publishers to easily access, buy and republish top editorial from European news organizations in their own languages, using AI data-mining technologies, summarization techniques and automatic translation technologies, alongside human content curation. Digital news media companies produce much more content than ever reaches their readers, because existing content delivery mechanisms tend to serve customers en masse, instead of individually. With €490,000 of funding from the DNI Innovation Fund, Helsingin Sanomat will develop a content recommendation system, using machine learning technologies to learn and adapt according to individual user behavior, and taking into account editorial directives. The recipients of fourth round funding were announced at a DNI event in London, which brought together people from across the news industry to celebrate the impact of the DNI and Innovation Fund. Project teams that received funding in Rounds 1, 2 or 3 shared details of their work and demonstrated their successes in areas like local news, fact checking and monetization. Since February 2016, we’ve evaluated more than 3,700 applications, carried out 935 interviews with project leaders, and offered 461 recipients in 29 countries a total of €94 million. It’s clear that these projects are helping to shape the future of high-quality journalism—and some of them are already directly benefiting the European public. The next application window will open in the spring. Watch out for details on the digitalnewsinitiative.com website and check out all DNI funded projects! This entry was posted in Google News Blog and tagged Google in Europe, Google News, Journalism & News on December 13, 2017 by Ludovic Blecher. 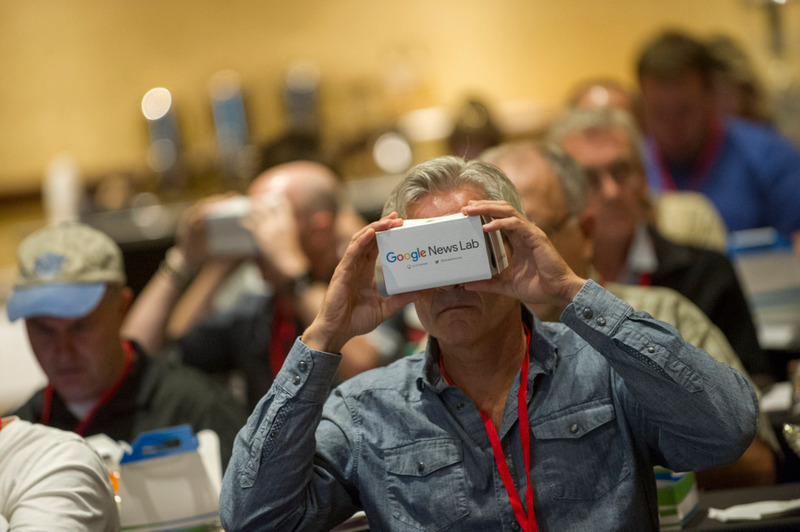 Editor’s Note: This week we’re looking at the ways the Google News Lab is working with news organizations to build the future of journalism. This is the first in a four-part series. 2017 was a critical time for both the news and technology industries. The battle against misinformation, rapidly-changing business models for news organizations and fundamental questions about the relationship between journalism and technology have made Google’s role in supporting quality journalism as important as it’s ever been. 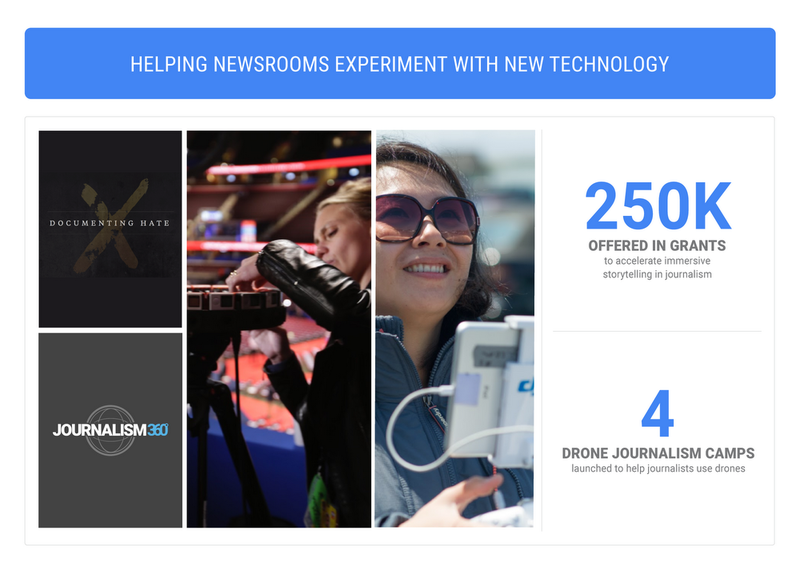 We started the Google News Lab in 2015 to work alongside newsrooms to navigate those issues and build a stronger future for news. No single technology, platform or partnership will solve every challenge the news industry faces, so we’ve focused on using our resources and technology to help newsrooms and journalists try new things. Three of the biggest challenges we focused on in 2017 were trust and misinformation, inclusive storytelling and local news. Today, we’ll provide detail on how we approached those challenges—and to ensure we’re tackling the right ones in the future, we’d love to hear feedback and new ideas. Though it's been a focus since we founded the News Lab, curbing the spread of misinformation and helping people understand what content they can trust has become even more important this year, in light of events across the world. Our efforts to fight misinformation focus on three key groups—platforms, newsrooms and consumers. Platforms: Google has launched a number of features to prevent the spread of misinformation on our platforms, and News Lab has built partnerships to strengthen those efforts. 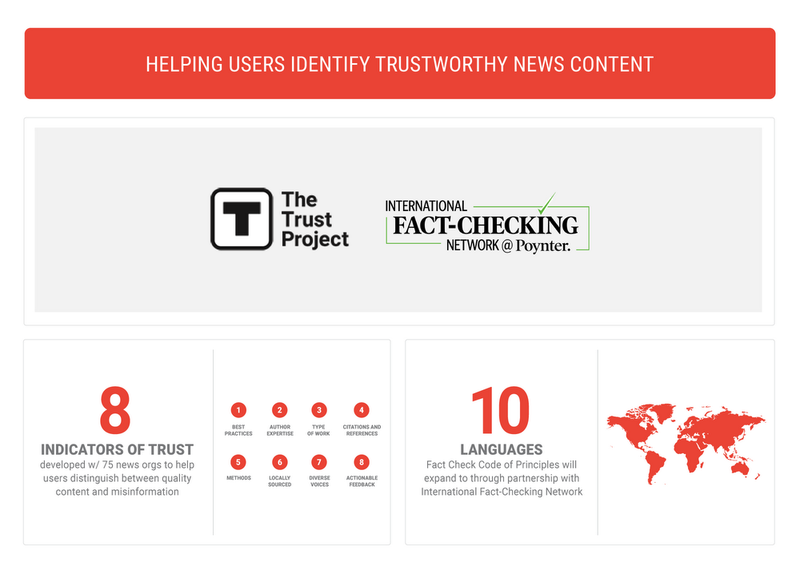 The Trust Project worked with 75 news organizations to produce eight trust indicators that newsrooms can add to their content to help people distinguish between reliable and inaccurate content. We're working with organizations like World Wide Web Consortium (W3C) and Schema.org to help publishers develop and communicate “signals” that platforms can use to identify quality journalism. We also introduced a tag on Google News and Search that helps consumers understand the validity of a newsworthy claim by providing information on the claim, who made it and an assessment of whether it’s factual. And we partnered with the International Fact Checking Network to support and grow the network of fact-checkers in the world with technology and training. Our goal is to double the number of fact-checking institutions in the network by 2019. Newsrooms: Discovering and debunking misinformation is a daunting task for any newsroom, but we’re encouraged by a new generation of organizations developing methods to meet this challenge. We helped start the First Draft coalition of digital media verification experts to combine efforts and share best practices with newsrooms everywhere. 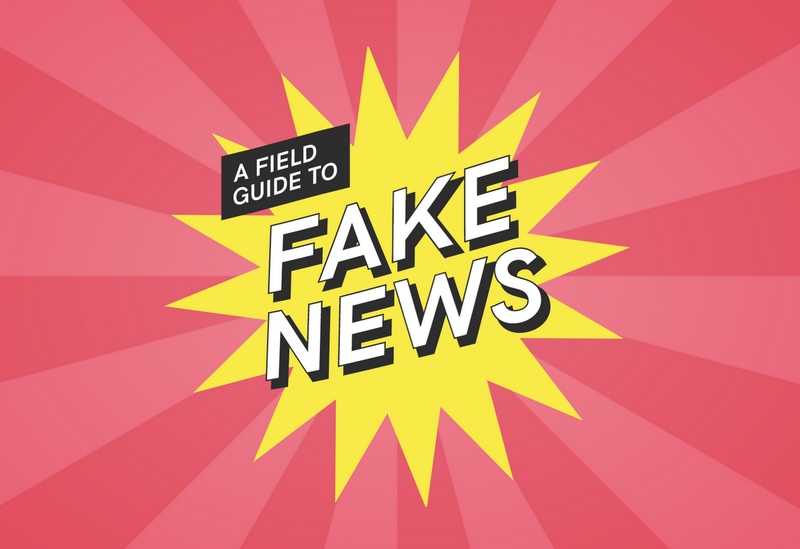 This year, they produced “A Field Guide to Fake News,” a playbook on how newsrooms can fight misinformation. Their recent report “Information Disorder” offers an excellent approach for understanding and grappling with misinformation. Along with hundreds of news organizations around the world, we created pop-up newsrooms to discover and debunk fake news stories and provide readers with accurate information during the U.K., French and German elections. Early research shows that this is working, and the effort in France received an ONA award for helping build a blueprint for verification around key moments. We plan to continue these experiments in 2018, and we’re developing tools and training on how our products can help in this area. Journalists from across France undergo training in verifying online content in run-up to French election. Consumers: In an age of information overload, we need to do more to help news consumers distinguish fact from fiction. Recent research out of Stanford suggests that news consumers—even young, tech-savvy students—struggle with parsing the difference between accurate and false claims. To help people develop skills to navigate news in a digital age, we launched a news literacy program in Canada, which we’re looking to expand in the coming year. We’re also working with our product teams to ensure our platforms help news consumers understand how to judge the credibility of content online, building on features like the publisher knowledge panel. This visualization from Polygraph shows how U.S. newsrooms have changed since 2001, according to ASNE’s survey data. In order for newsrooms to serve their readers and uncover the most important stories in their communities, they need to reflect the diversity of their markets. But this remains a challenge: in a survey we produced with the American Society of News Editors, we found that diversity in U.S. newsrooms hasn’t improved much over time. For instance, men still make up 63 percent of newsrooms in the U.S. So we’ve focused our energy on partnerships to empower journalists from a diverse range of backgrounds and communities. 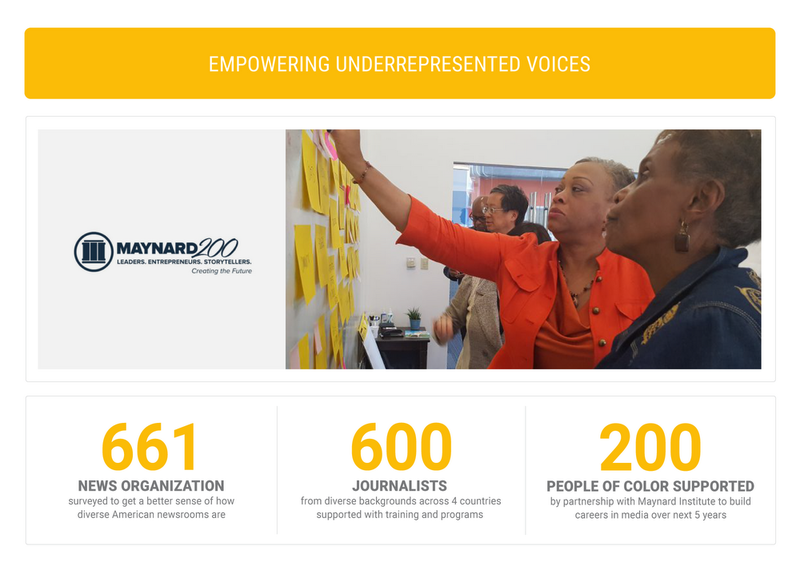 We’re working with Maynard Institute to support 200 people of color in media, and we backed the Street School in France and the Hamburg media school in Germany to train young journalists from underprivileged backgrounds. We’ve also created fellowships and programs to give diverse journalists new opportunities, with groups like NCTJ Journalism Diversity Fund and Neue Deutsche Medienmacher. We also think technology can play an important role in understanding bias in news. In 2016 Google.org, USC and the Geena Davis Institute used machine learning to create a tool that identified gender distribution in Hollywood. We’re building on this work to explore how newsrooms can apply the same technology to better understand representation in news coverage. Local newsrooms have been hit hard by the shift to digital, with revenue pressures causing local newsrooms to shrink—or worse, close down. Through a partnership with the Society for Professional Journalists, we’ve trained more than 9,500 local reporters across America on essential skills, from multimedia storytelling to safety and security, in the last year. And our partnership with the Center for Investigative Reporting’s Reveal Labs gave local journalists in Mississippi and New Jersey the resources to experiment on new models for investigative reporting. We’re looking at new models for strengthening the local news ecosystem, through initiatives like Report for America, which will place a thousand journalists in local newsrooms in the next five years. Over the next six months, we’ll pilot the program in 12 local newsrooms in areas underserved by local news media. Feedback from journalists and others in the industry is important to our efforts. We’d love your feedback, which you can share through this form. In our next post, we’ll talk about how we’re helping news organizations navigate new technologies—like virtual reality, data visualizations and machine learning—in their newsrooms. This entry was posted in Google News Blog and tagged Google News, Journalism & News on December 12, 2017 by Steve Grove. This entry was posted in Google News Blog and tagged Google News, Journalism & News on December 6, 2017 by Simon Rogers. Data Journalism—the skill of combining reporting with data—is becoming an increasingly important part of every journalist’s toolkit. That’s not just anecdotal: a recent study commissioned by the Google News Lab found that half of all news outlets have at least one dedicated data journalist. So, for the seventh consecutive year, we’re proud to support the 2018 Data Journalism Awards. These are the only global awards recognizing work that brings together data, visualization and storytelling. It’s a part of our commitment to supporting innovative journalism around the world. Data journalists, editors and publishers are encouraged to submit their work for consideration using this form by March 29, 2018. But don’t get too comfortable with that deadline, early applications are encouraged. Last year there were 573 entries from 51 countries across five continents. Past winners of the $1,801 prizes include include BuzzFeed, The Wall Street Journal, The New York Times, FiveThirtyEight, ProPublica, and La Nación, as well as smaller organizations such as Rutas Del Conflicto, Civio Foundation and Convoca. And if you’re wondering why the prize is $1,801, It’s because William Playfair invented the pie chart in 1801. The competition is organized by the Global Editors Network: a cross-platform community of editors-in-chief and media professionals committed to high-quality journalism, with the support of Google and the Knight Foundation. The Data Journalism Awards offer another way to foster innovation by partnering with the news industry, in addition to our efforts with the Digital News Initiative. A jury of peers from the publishing community will decide on the winners. Winners will be announced in May 2018 at a ceremony in Lisbon. Good luck! This entry was posted in Google News Blog and tagged Google News, Journalism & News on November 30, 2017 by Simon Rogers.